The coldest month in Guilin is Jan-Feb (highest 12 low 5 in C; high 55 low 42 in F). From March to December it is good for biking with the exception of June during the rainy season. The hottest months are Jul-Aug (high 33 low 25 in C; high 91 low 77 in F). Guilin has a mild climate. The rain seldom stops usually after the Chinese New Year (usually in February). The weather between late December and January is uncertain and depends on your luck if you travel on these months. The annoying rains happens a lot from Feb. to Even June, the scenery in Guilin is extremely different based on good/bad weathers. Travelers are possible to see the heaven or nothing interesting. 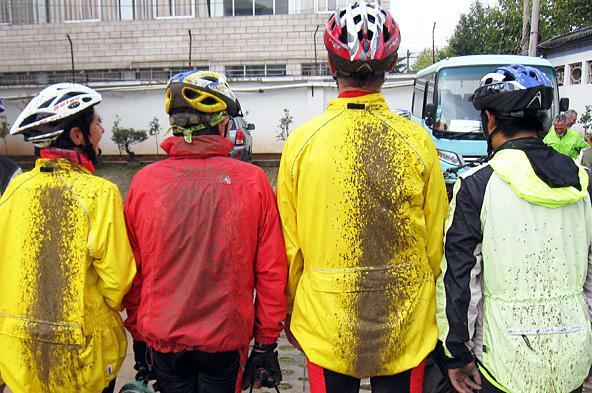 The autumn is the best time to have bicycle trip in Guilin areas. Golden gingko leaves, the fiery-red maple trees, and the silver-gray reeds - this colorful world lasts only about 1-2 month every year, usually between late November and early December. A bike tour from July to October is also perfect. Riders will have a great chance to see the heavenly-like Li River and a Green world of the country life. The blue sky and lovely clouds will be kept on your photos and become a long-term memory. The rain is likely to bring troubles to riders - road will become dirty and slippery, the blue sky is no longer found, rivers and lakes turns into feculent. Bicycle mudguard can only help us on well-paved roads. It is a potential risk when biking on off roads, as the mud accumulates between the wheels and the splash guard. It is also easy to break after many shocks. However, bicycling in raining seasons also gives us a chance to see perfect scenery when the sun shines again after rain. The misty landscape pictures appear. The bird sings again, your cloths may get wet in the rain and dry again in the sun for many times during the biking. The murmuring brooks and grand waterfalls are hidden among the mountain areas in and around Guilin. Getting out of the rain in local shops/houses or suffering the same tough experience on road with mates, and finally successfully completing the cycling program is one of those interesting parts that make a biking journey so unique. 1. Light, ventilate and waterproof rain coat is recommended. It helps riders to keep the coat dry in spring and autumn but it is not so effective in summer as it is so hot inside. The one-off rain coat is enough for sprinkle days. It is also a good choice in summer. 2. V-brake bikes have poorer braking forces, especially in rains and on muddy roads; a good disk-break is more reliable for long-distance and all-terrain cycling journey. 3. Emergency breaking increases the chance to fall down from your bicycle. The brakes are used mainly for slowing down properly, so try best to avoid an instant balking, especially in downhill areas. 4. Chain oil needs to be recoated after the water dries by wind and sun. Before that, clean up the crankset, chains, freewheel, and the guide wheels on rear derailleur.